Welcome to Kingstonist’s weekly challenge, dare, resolution or whatever you prefer to call it. Each week we establish a new and ambitious community goal, encouraging our readers, followers, friends and families to step out of their comfort zones and do something great, and hopefully a little out of the ordinary. Consider this your official and personal invitation to join us in completing a small but meaningful achievement. By taking part in this community-wide initiative, we hope to make Kingston a slightly better place to live, work and play. And of course, we also hope that you will feel proud of your contribution and achievement. 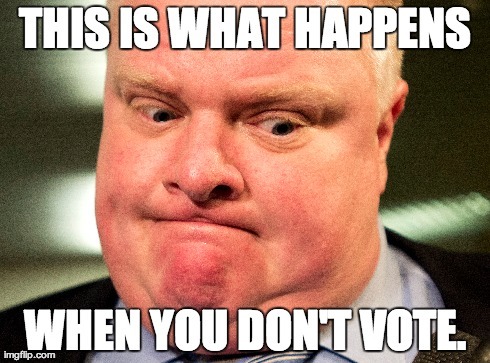 Vote in the 2014 Provincial Election! Today’s challenge isn’t geared towards those who’ve already voted in advance polls or are otherwise planning on voting when polling stations open up across the city later today. Rather, this challenge is specifically calling on those of you who are planning on passing up on the opportunity to have your voice heard. Time and again, I run into eligible voters who paradoxically have a great deal of criticism for our elected officials, but for whatever reason, they failed to cast a ballot. Stack up all the votes that were never cast due to indifference or cynicism, and the story of who is elected at the end of the day is undoubtedly different. If you feel that your vote is simply picking the lesser of supposed evils, or that your candidate will never get in, you are not alone! No one is guaranteed a win in Kingston and the Islands. Long shots can get elected. And, if you do not participate, keep in mind what the results could look like and how that could affect us all for the next four years and beyond. There’s still time to get informed, choose a candidate and take a quick trip to the polls. Find your nearest polling station here and vote. Sign up and commit to completing this week’s challenge by commenting below with an “I’m in“, “challenge accepted“, “en garde” or something along those lines. Further, help us spread the word via Twitter and Facebook by using the hashtag: #ygkchallenge. As you work towards completing this week’s task, please feel free to lend others a helping hand by providing tips on how you achieved success. Thanks to Mike Gifford for today’s photo.